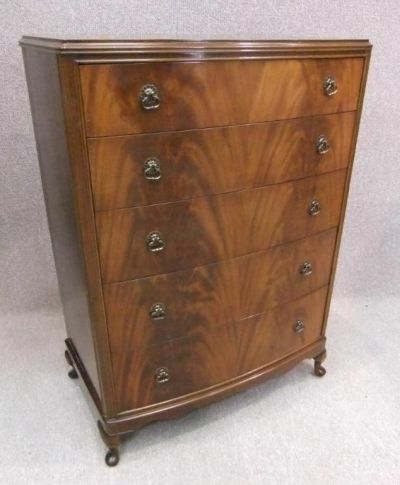 An attractive 1940s mahogany bow fronted chest of drawers. This piece features five drawers; all fitted with their original handles, and stands upon four Queen Anne style legs. At some stage in its life, it has had castors fitted to the underside; enabling this chest to be moved easily (for cleaning purposes etc). The chest is in beautiful condition, with just a slight amount of wear and tear.